April is already well into double figures, in date terms if not in temperature, and I find myself apologising yet again for the lateness of last month’s Love to Dine Dish of the Month post. Pretty much all of the dishes we ate at Dinner by Heston Blumenthal were strong contenders, but I’ve actually chosen something altogether more simple, but equally delicious in its own way, albeit it was technically two dishes, rather than one! A friend and I were looking for somewhere to dine in Cardiff on Wales v. England day in the Six Nations, which was a tough call as almost everywhere seemed to be booked up, but then it dawned on me to try Fish at 85 in Pontcanna – a favourite of mine, and somewhere I felt sure my friend, who loves fish, would enjoy too. Luck was on our side, as a table was available. We had an excellent meal there (including some of the best chips in Cardiff! ), but the real highlight for both of us was our starters. John, the fishmonger at Fish at 85, recommended that we order two starters to share between us, and that we should really try the salt and chilli squid, which was served with a dip that brought together a whole range of flavours including soy and shallots, plus the king prawns with chilli and garlic. These two simple dishes were absolutely exquisite. The squid was served in a beautifully light batter and had been cooked just long enough to crisp the batter but leave the squid amazingly tender, without a hint of rubberiness. Squid can range from one of my favourite things to one of my least favourite, depending on how it has been cooked, and this was definitely in the former category. Neither the salt or chilli was overpowering, but instead brought the dish to life. 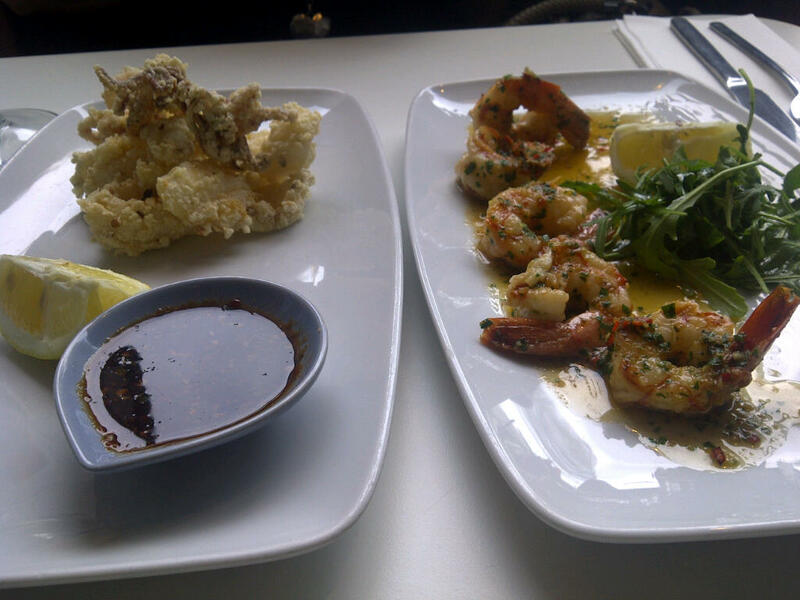 The prawns were sweet, juicy and delicious – my friend took one bite and pronounced them to be the best she’d ever had in Britain. The sauce was very tasty but light and fresh, with finely chopped parsley adding an extra dimension. Fish at 85 remains a firm favourite for me, with consistently good food, wonderful service and a true passion for the dishes from John and the team.